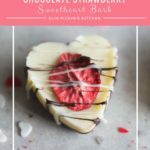 This chocolate strawberry valentine’s heart sweetheart bark has only 3 ingredients, is ready in 15 minutes, and is a super simple sweet treat perfect for Valentine’s Day. 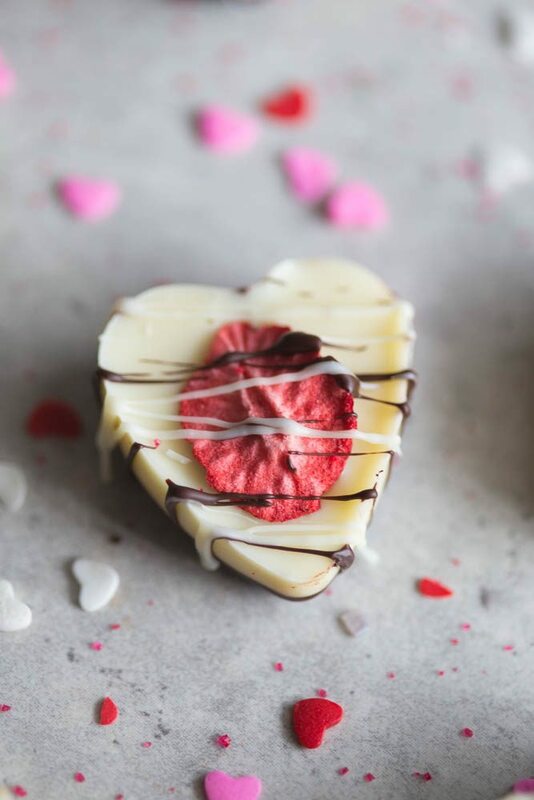 Made with smooth layers of rich dark chocolate, creamy white chocolate, and sweet dehydrated strawberries, it’s the perfect way to indulge yourself or your sweetheart! Over a year since I have graced you with my presence and provided you with a new recipe, health update, boozy cocktail or anything in between. Lawd have mercy what a whirlwind of a year its been! Sooooo…y’all remember that brain tumor I told y’all about ages ago? Yeah. That thing. It’s been operated on, poked, prodded, zapped and monitored more than I have liked, and the details of that adventure (along with some absolutely hideous photos of me in the hospital) will be coming up on my one year surgery anniversary later this month. I have such a crazy story to tell, it’s probably going to take several posts to get you up to date on all things craniopharyngioma. Until then, let’s talk about homemade chocolate valentine’s hearts! I love Valentine’s Day because it is a day where I embark on a very important self-care ritual and head to the Godiva store in downtown Charleston to build myself a box of truffles. Gazing through the glittering glass at the raspberry starfish, cherry cordials, midnight swirls, and mint chocolate medallions makes my heart sing a symphony of 80’s style power ballads. It’s a special treat I give myself twice a year (Valentine’s Day & my birthday), but it’s also a great way for me to enforce some extra snuggle time with my husband as well. We bundle up in the bed or on the couch, choose a truffle, each take a taste, swoon and he-haw over how incredibly indulgent they are and then feed each other the other half of the sweet treats. We eat only one each a night, thereby making the box last nearly a week and insuring we savor each and every luscious truffle. This year though? This year calls for an extra bounty of Valentine’s Day chocolates. 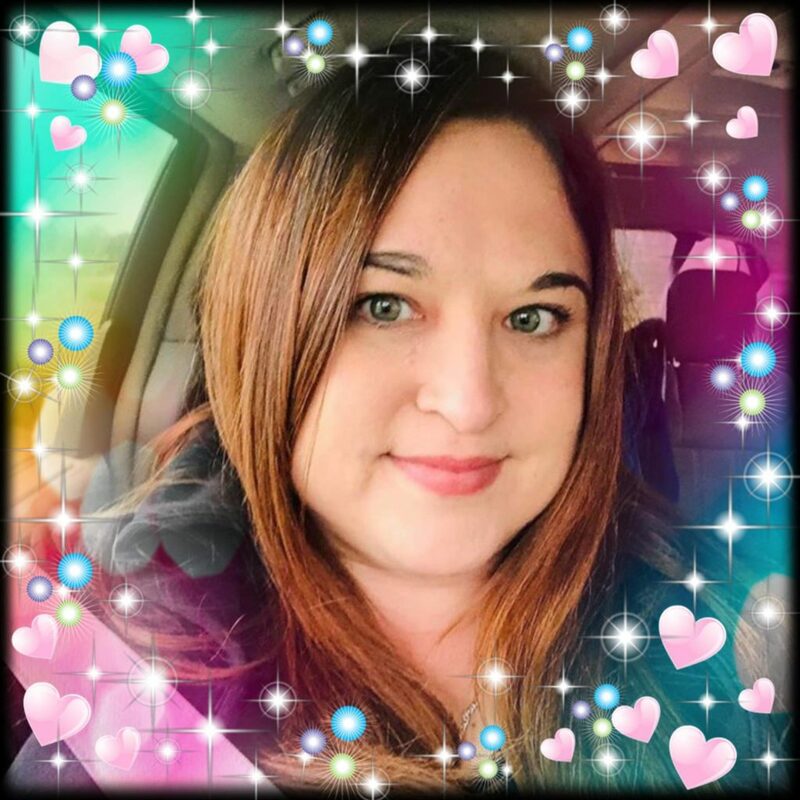 Words can not express how fantastically amazing my husband has been throughout this whole brain tumor ordeal, so I felt it was important to make him something from the heart. He’s a major chocolate strawberry person, and this chocolate strawberry sweetheart bark is right up his alley. 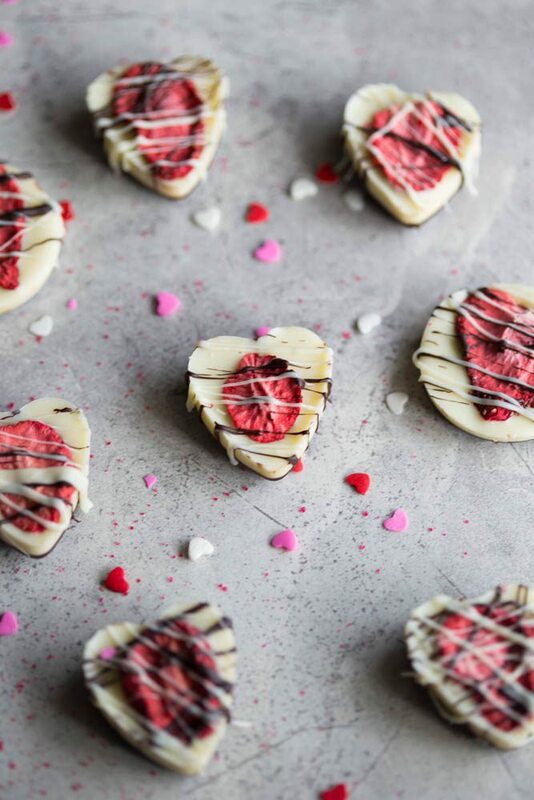 Homemade chocolate bark is one of the easiest desserts in the world to make, and I jazzed it up a bit by putting it in a heart shaped mold to go along with Valentine’s Day. Don’t feel as if you have to go out and buy a separate heart shaped candy mold though if you don’t already have one! A mini muffin tin works just as well, and if you don’t have one of those? 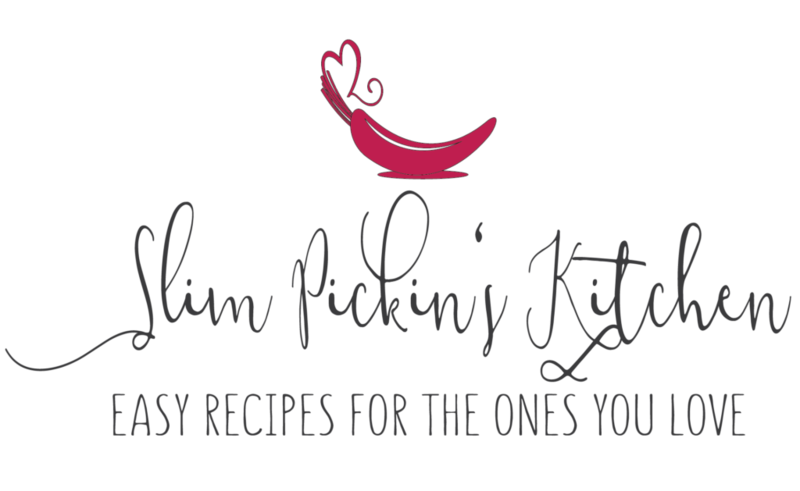 Just follow the instructions as is but, instead of putting the melted chocolate in a mold, spread the silky confection on a parchment paper lined cookie sheet just like any other homemade chocolate bark recipe. I chose to use dehydrated strawberries in this recipe because they last a lot longer than fresh berries. Fresh strawberries also tend to bleed their fresh juices, and I would like to avoid a St. Valentine’s Day massacre this year thank you very much. The recipe for this chocolate valentine’s heart sweetheart bark really consists of doing nothing other than melting chocolate, freezing, then melting again. It truly couldn’t be simpler! 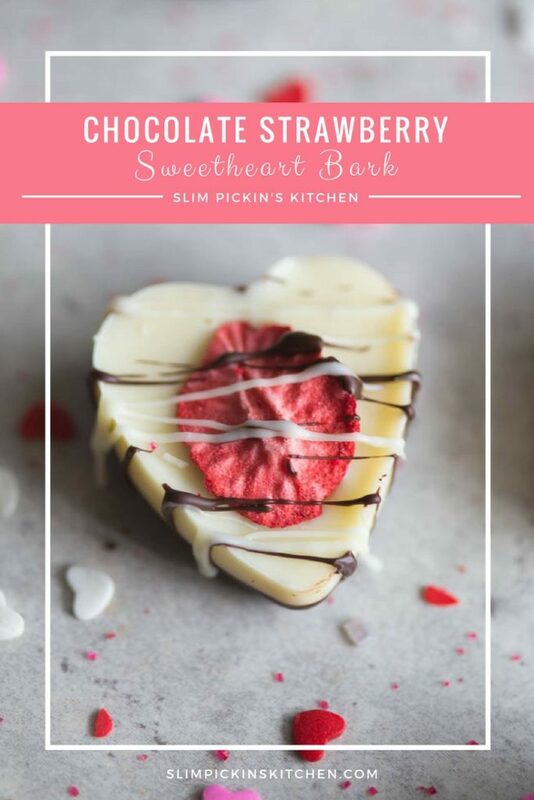 This chocolate strawberry valentine's heart sweetheart bark has only 3 ingredients and is a super simple sweet treat perfect for Valentine's Day. 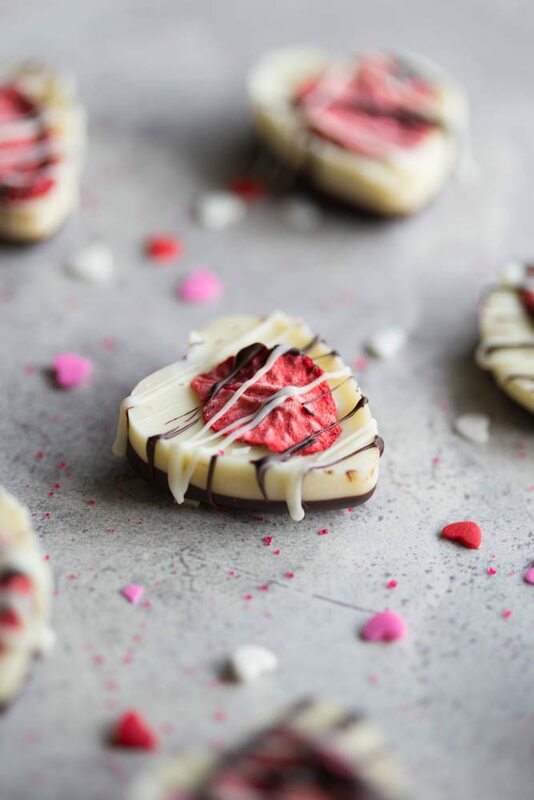 Made with smooth layers of rich dark chocolate, creamy white chocolate, and sweet dehydrated strawberries, it's the perfect way to indulge yourself or your sweetheart! Break the dark chocolate into pieces and place in a glass bowl. Microwave for 30 seconds, stir, then repeat this process, stirring every 30 seconds, until the chocolate is melted. About 1.5 minutes. 2.Add 1 tsp of melted chocolate into each segment of your mold or tin. 3. Freeze for 5 minutes. 4. Repeat steps 1 & 2, layering the white chocolate on top of the dark chocolate, then top with dehydrated strawberry and freeze for another 4-5 minutes. 5. Remove chocolate strawberry sweetheart bark from the molds and drizzle with remaining white and dark chocolate. Freeze or refrigerate until ready to serve. Check out these other Valentine’s Day Recipes! Skinny Funfetti Cupcakes w/ Cake Batter Marshmallow Frosting for Two! Girl, you already know how happy I am that you’re getting back into gear! You’re a hell of a woman, and I’m so glad you beat that tumor. <3 Feel free to send me some of this adorable bark when you make another batch LOL! !